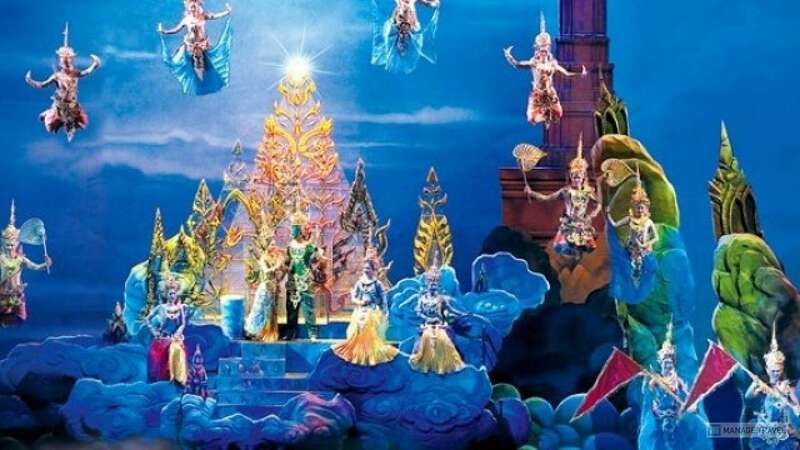 Dazzling Spectacle on the Word's Highest Stage Held in the colossal 2,000-seat Ratchada Theatre, the Siam Niramit show boasts an 11.95 metre proscenium - certified by Guinness World of Records as the world's highest stage. 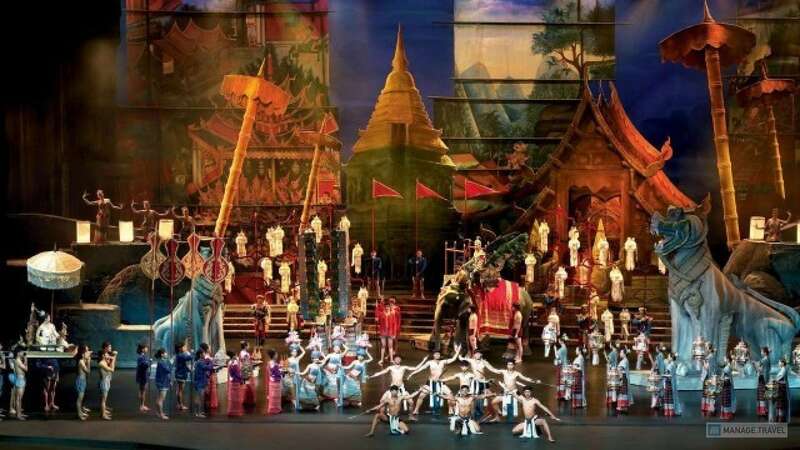 Occupying more than half of the entire theatre space, the panoramic Ratchada Theatre stage is built to accommodate the show's monumental set pieces and a legion of performers (including real elephants and goats) to recreate a realistic ambience of Siam hundreds of years ago. The show is suitably structured into three acts: Journey Back into History, Journey Beyond Imagination: The Three Realms and Journey Through Joyous Festivals. Reliving the Glorious Past The lights suddenly dimmed and permeating through the darkened stage is the heart-thumping beat of 'klong sabatchai' (victory drum), followed by the graceful golden fingernail dance and sword dance. 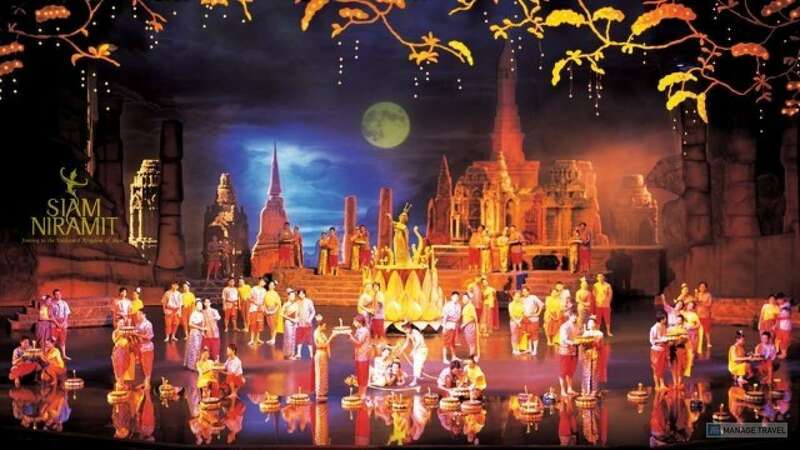 The entire stage is re-lit and awoken back to life with a scene of the Ancient Kingdom of Lanna, showing a slow-paced, yet elegant royal procession led by the King and Queen of Lanna, the earliest of Siamese reigns. A stark contrast to the north, the audience is transported down to the more animated south with the next scene: The South Sea... Traders from Overseas. Opening with 'nang talung' (shadow puppets) and the lively and colourful 'nora dance', this scene is the re-enactment of the Kingdom Sriwichai's bustling market full of foreign traders, and with a whimsical subtext of interracial crush - a representation of the harmonious existence of different faiths and races. The next two scenes, The Northeast... Heritage of the Khmer Civilization and Central Plains... Ayutthaya: The Mighty Capital, are superbly portrayed with state-of-the-art special effects like an on-stage 'klong' (river), realistic rainfall, thunder and lighting. The audience also gets to witness local activities and festivities like 'ram lao krathop mai (bamboo dance), the singing of rice harvesting folk songs and Thai boxing matches during these scenes. Siam Niramit Phuket opens daily except Tuesdays. 6.00 pm. - Buffet dinner begins serving. 8.30 pm. - Show starts (Show duration in 70 minutes). 10.30 pm. - Gates closed. Other than the spectacular show, do come early because there are lots of activities that you can see and do. Not only will you enjoy but you will learn more about the Thai ways of life in bygone times which is not easy to find nowadays.